Mini Bike Pump - is a necessary tool for everyone who has a mountain bike or road bike or fat and kids bicycle, etc. Our mini bicycle pump is suitable for all types of bicycles, wheels, fitness balls, children's balls, toys, jumpers, and trampolines. This mountain mini pump is for those emergencies that arise when on the trails in the middle of nowhere. This mini bike pump is really compact and works as well as others twice its size. Mounted on a solid base under the pump on the bicycle with an elastic rubber strap - bike pump allows you to tighten the pump on the frame and not lose it when riding. The hose stores securely inside the portable pump, and there are very durable dust plugs on each end to keep dirt and grime out. You don’t have anything to screw in or on - the hose is hiding in the middle of the pump. Universal - Presta and Schrader valve bike pump (the tip-adapter is rearranged). Short pumping action produces startlingly quick results. Inflated a flat tire in 60 seconds with our bike pump. Bicycle pump can easily fit in backpacks, frame bags, and pockets. Included mounting bracket allows for easy mounting onto any bicycle frame. What are you waiting for? Get your mini bike hand pump today, while supplies last! 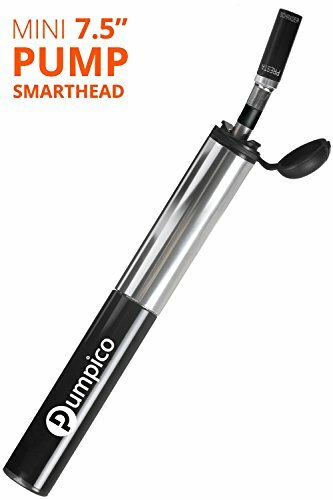 PERFECT GIFT IDEA: If you're looking for a very unique and perfect gift - you have already found it in our mini bike pump. Best Presta and Schrader valve bike pump for any bike-lover! If you have any questions about this product by PUMPICO, contact us by completing and submitting the form below. If you are looking for a specif part number, please include it with your message.